A new federal spending bill represents a cut to NASA's funding, but a lessening of restrictions on how the agency spends that money for the rest of this year. The new measure is a political compromise between democrats and republicans, and includes significant spending cuts in the 2011 federal budget. NASA will have to make do with about $18.5 billion, putting its budget roughly $240 million below last year's funding level. NASA and the rest of the federal government had been in limbo while lawmakers haggled over the budget. But on Thursday (April 14), Congress passed a spending measure called a continuing resolution that will cover the last five months of the year 2011. The new budget compromise followed a series of stopgap measures Congress had used to fund the government in lieu of agreeing on an official fiscal year 2011 budget. Experts said NASA will likely be able to accomplish most of the plans on the table under the new bill. "NASA will be able to do what it has to do until the next budget," space policy expert Roger Handberg, a political science professor at the University of Central Florida, told SPACE.com. "NASA has been survival mode since last fall when the first continuing resolution was put in place." Now the space agency will finally be free to stop spending money on canceled Constellation projects. "The elimination of the Constellation provision will free up resources otherwise committed," Handberg said, saving NASA some of the money that it loses in the reduction of its annual budget. 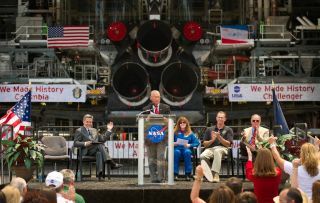 NASA leaders expressed gratitude that the agency can now move forward fully toward its new direction. "This bill lifts funding restrictions that limited our flexibility to carry out our shared vision for the future," NASA administrator Charles Bolden said in a statement. "With this funding, we will continue to aggressively develop a new heavy lift rocket, multipurpose crew vehicle and commercial capability to transport our astronauts and their supplies on American-made and launched spacecraft." Overall, Bolden admitted the need for spending cuts, and was optimistic that they agency would be able to do a lot with what it's given. "We are committed to living within our means in these tough fiscal times - and we are committed to carrying out our ambitious new plans for exploration and discovery," Bolden said.